New Year 2015 will be celebrated at Sri Jin Kushal Suri Dadabadi, Malpura with great enthusiasm. Anuradha Podwal, famous singer, will sing devotional songs on the eve of New Year on 31st night to welcome New Year 2015. 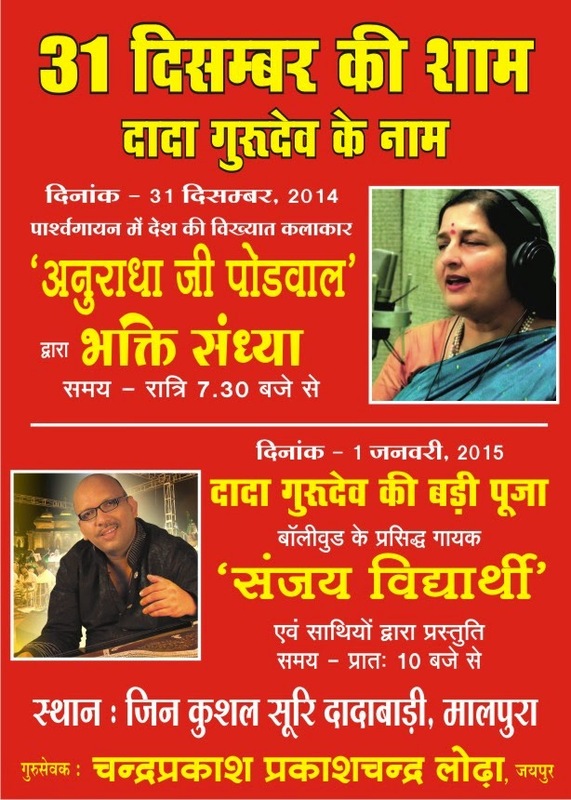 She will sing Bhajans of Dadagurudev in the "Bhakti Sandhya" from 7.30 PM till midnight of 31st December 2014. There will be Badi Pooja of Dadagurudev on the next day, January 1, 2015. Renowned Bollywood singer Sanjay Vidyarthi will perform on this occasion. Several groups of Sadhvi Ji will grace this occasion with their presence. Poojya Sadhvi Sri Chandrakala Sri Ji, Sri Mnohar Sri Ji, Sri Shashiprabha Sri Ji, Sri Sulakshana Sri Ji, Sri Punitkala Sri Ji and Sri Shraddhanjana Sri ji are expected to be there with their groups. We expect at least 31 Sadhviji Maharaj on 31st. Sri Chandra Prakash Prakash Chand Lodha family, devotees of Dadagurudev have invited all Gurubhakt to come and join the event. Sri Jain Shwetambar Khartar Gachchh Sangh, Jaipur has permitted the family to organize the event.